A nice soprano size ukulele including a matching color soft bag. The ukulele has a warm tone, good i..
A nice soprano size ukulele including a matching color soft bag and stickers. 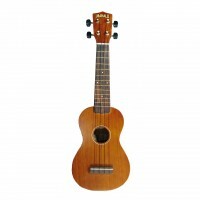 The ukulele has a warm..
You’ll find a host of professional features and the gleaming beauty of genuine curly malapoga ..